Paperback and Kindle from Amazon. 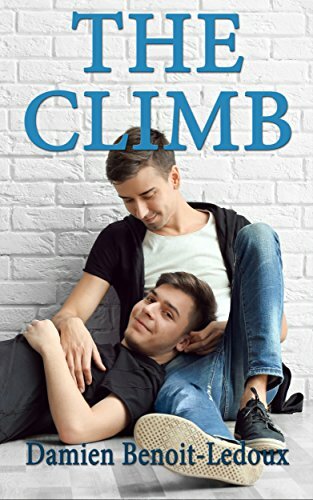 THE CLIMB is the uplifting coming-out-gone-wrong story of sixteen-year-old Skyler Phoenix and his journey to find love and acceptance after his devout foster family kicks him out for being gay. Skyler’s athletic good looks and charisma make him a sought-after prize among the girls at Cornerstone Christian Academy. There’s just one problem: Skyler and Cameron, his best friend, fell in love months ago and they enjoy spending as much time as possible together. Since their parents and their conservative churches vehemently disapprove of homosexuality, the boys agree to become secret boyfriends until they can find the courage to come out to the world. Life is great until their parents accidentally discover their dirty little secret and all hell breaks loose. Disgusted, Skyler’s foster parents evict him when the ex-gay prayer therapy they send him to doesn’t work. Torn from his world and relocated to a new foster home several hours away, Skyler finds himself struggling to believe his strange new family would welcome him—sinful gayness and all—into their home. When Skyler meets Dale and Liara Kelley, their teenage son Colton, and his inner circle of friends, he resists the welcoming arms that offer him unconditional love without judgement. With defenses around his heart and his trust at an all-time low, the once-strong Skyler struggles to accept himself even when his new friends and an especially cute guy named Kalin Mars offer him the chance to believe in love again. Please enjoy this exclusive treat for Spotify* users. Check out the official playlist of The Climb, an LGBT coming-of-age novel by written by me. This story’s main character, Skyler Phoenix, curated this special playlist for you to enjoy.